The holidays are definitely more fun when the games are brought out of the closet and everyone can let loose a little bit and have some fun. 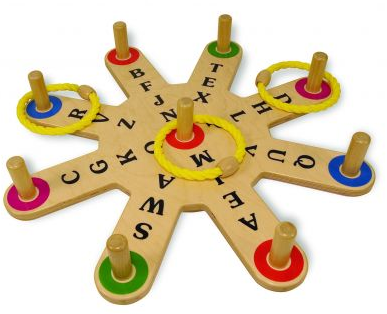 One of our favorite Games in our TOY Collection is the Ring Word Toss Game. In this game, each person tries to toss the ring onto a peg to win a letter and build a word. Players alternate turns, and keep track of words they are building on the included hand-held score boards, with paper or on a chalkboard. The game can be played in teams or as individuals, and difficulty increases as words get longer, and also as the distance between the base, and the throwing line is increased. Other games in the TAG Toys collection include the Word Discovery Game, Picture Completion Game, and the Number Ring Toss. Join the Conversation, ask us a question of your own on Facebook. This entry was posted in Childhood, Childhood Development, Children, Education, Kids, Pre School Kids, Toddlers, Toys, Uncategorized and tagged activity, christmas, family, fun, game, gift, holiday.